Almost five years ago, the biggest floods and landslides in new history affected Bosnia and Herzegovina, leaving thousands of citizens without property with the homes destroyed. The international community sent help, but those who suffered the consequences of the flood did not just need blankets and tents, what they need is to build a new life. Several international organizations, leaded by EU and UNDP triggered the Flood Recovery Programme with several sub-projects aimed to help to those who need it and continued to give them a fresh chance for new start. 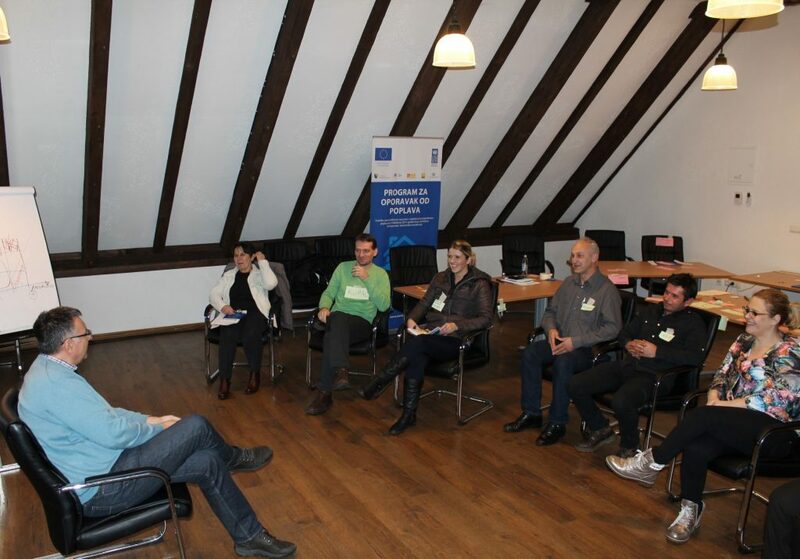 So, the beneficiaries of Flood Recovery – Housing Interventions Programme from Doboj, Zenica, Goražde, Bijeljina, Zavidovići and Travnik completed on Thursday the first of three training modules on entrepreneurship and small businesses. This marks the start of extensive activities financed by the European Union with the aim of providing economic empowerment to vulnerable families from flood and landslide affected areas. Aida Halilović from Goražde, one of the participants of the training, pointed out that she came to learn how to manage her small business. “I would like to learn how to start and maintain my own business and I am happy with the training so far”, she said. EU Delegation to BiH explained in a press release that, besides the beneficiaries of the self-employment and small business package, beneficiaries who will receive support with agriculture assistance and employment were also selected through this Programme. As a result, a total of 214 households from 34 municipalities and cities in BiH will participate in economic empowerment. Besides economic empowerment, the Programme will also provide safe housing for around 2,800 people whose homes were destroyed or damaged in 2014 floods and landslides. “In cooperation with local authorities, the European Union continually supports the recovery of local communities from the effects of the floods and landslides in BiH. For this Programme, the European Union allocated EUR 12.5 milion. We are rebuilding the infrastructure and, at the same time, helping economic development. Economic development is important for people in local communities of affected areas because it secures new jobs and economic stability”, said Gianluca Vannini, Head of Section for Social Development, Civil Society and Cross Border Cooperation in the Delegation of European Union to BiH. In the upcoming period, selected beneficiaries of the Programme will acquire the skills necessary for developing and managing their own small businesses. Upon the completion of the training, presentation of business ideas and plans will be organised based on which beneficiaries will start with small business registration. Beneficiaries will receive necessary equipment and tools to start their business ideas, while mentoring and business advisory services will be provided for all newly established small businesses. “We are very pleased that, besides the provision of housing units, we have an opportunity to participate in economic empowerment of families whose homes were destroyed in the 2014 floods and landslides. Entrepreneurship and self-employment creates jobs, develops skills and provides an opportunity for the inclusion of vulnerable persons in the economy, and represents an important step in the recovery of the communities”, said Edis Arifagić, Head of Local Development Programme in UNDP BiH. The Flood Recovery Programme – Housing Interventions provides support to self-sustainable recovery through provision of housing units and economic empowerment of socially vulnerable population whose homes were damaged or destroyed in the 2014 floods and landslides. The programme, valued at EUR 15 million, is financed by the European Union in the amount of EUR 12.5 million, in cooperation with Government of Federation of BiH, Government of Republika Srpska, local authorities of partner cities and municipalities, and UNDP in BiH.